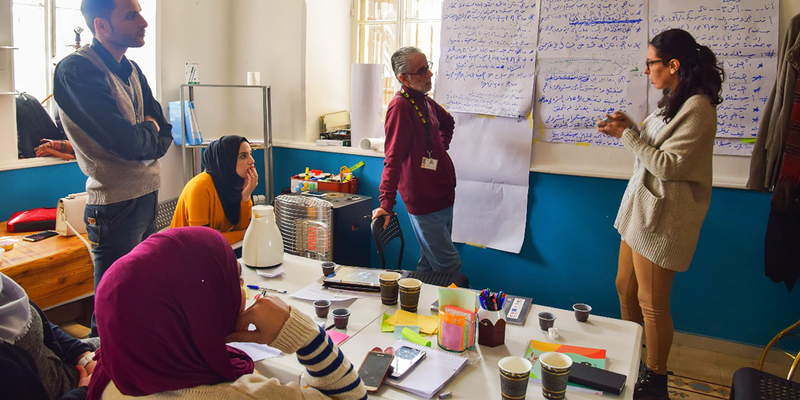 Mahali Lab, started by the International Rescue Committee’s Airbel Center in Jordan, is a community-driven innovation lab focused on fostering community engagement in identifying and solving challenges posed by long-term displacement. 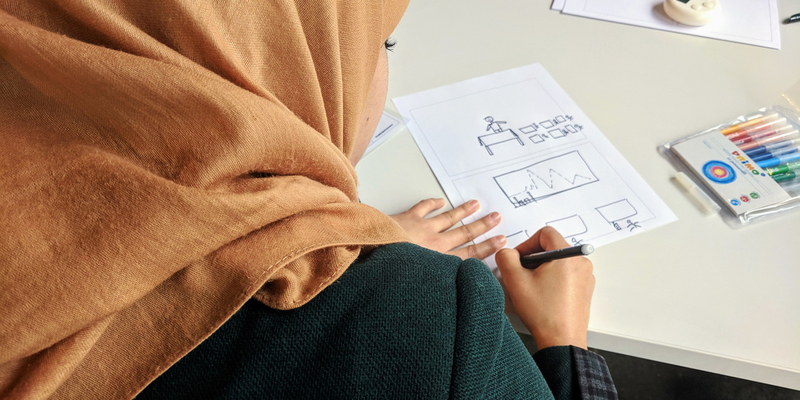 As design manager of Mahali, I helped design and implement the lab's tools and processes, identify community problems through design research, and train high-potential lab participants. How do we ensure that we provide solutions to the right problems? How do we ensure that we find the right people who are best suited to find and formulate those solutions? 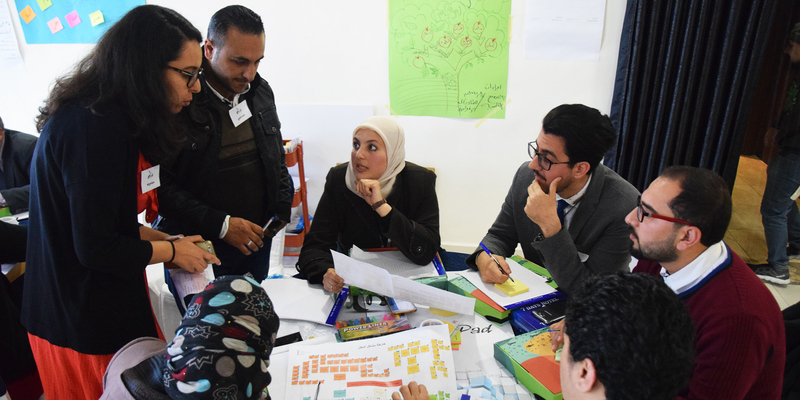 How do we ensure that we provide the right support to those people to test, implement, and scale their solutions? We embarked on a three-month journey to let the community guide us in defining problems worth solving. 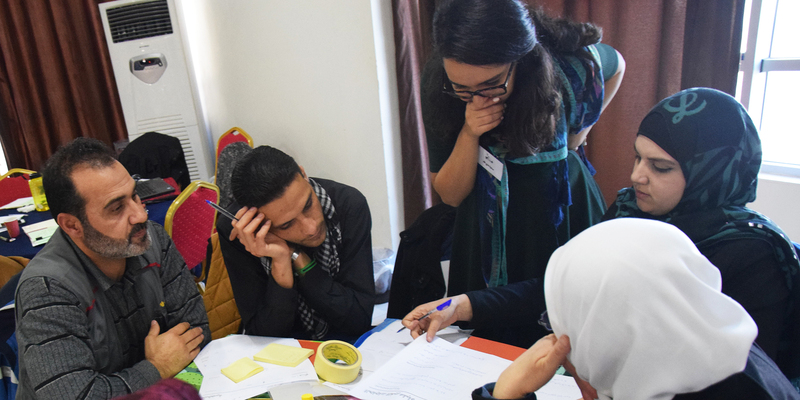 Our key research question was: What are the articulated and unarticulated challenges and needs that occupy the time, efforts, and mental energy of Syrian refugees and their host communities? 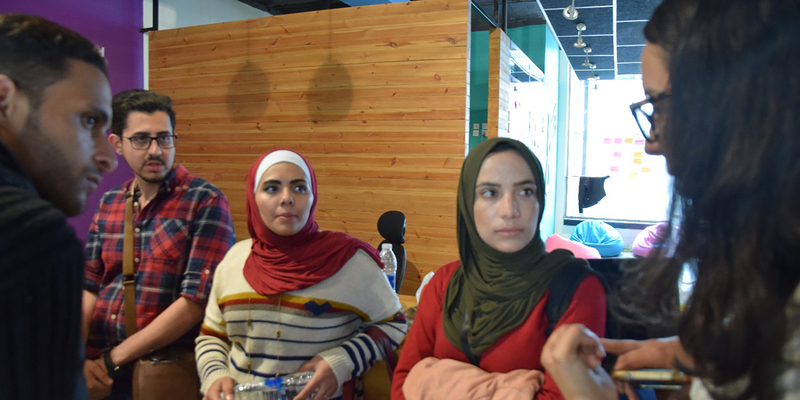 We conducted a series of open-ended, semi-structured interviews and focus group discussions in three localities with high concentrations of urban refugees: Amman, Irbid, and Mafraq. We met either in neighboring community centers or people’s homes. One benefit of this method, in addition to learning from the participants’ environment, was the potential to gather more participants by bringing in additional individuals from the same building. After a long synthesis, we held a larger community workshop to validate our understanding and interpretation of the data with community members. Invited attendees were asked to confirm, reject, or nuance our understanding of the problems and issues they shared, or to add anything that we might have missed. Equipped with this validated data, we extracted key patterns of experiences across locations, genders, and age groups, culminating in six main problem statements. 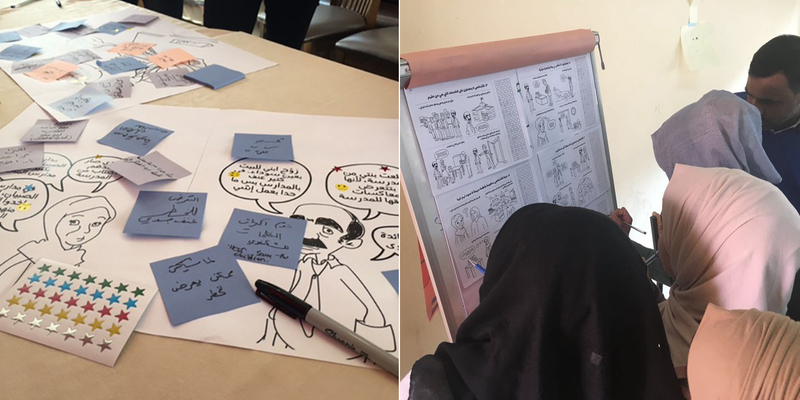 We represented each one with a storyboard, based on the stories and quotes we collected during the consultation process and asked the community to vote on the challenges they believed were most crucial. Community members voted one challenge to be the most pressing: income. That was, however, such a broad topic, that framing an opportunity space — a lens for constraining the problem that would maximize potential solutions and inspire participants to join — became difficult. 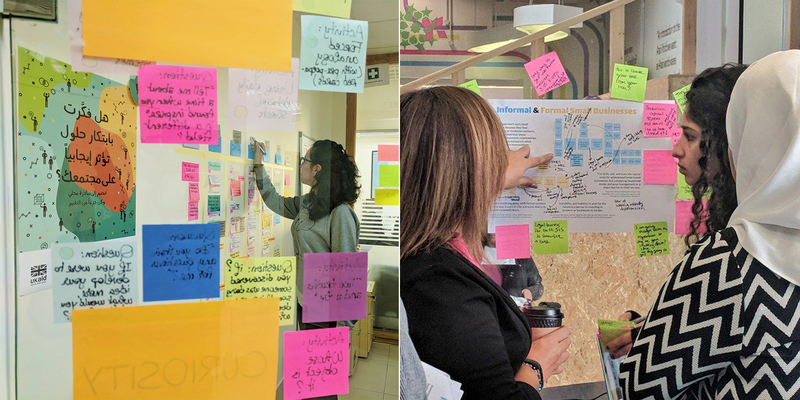 As a result, I led a short design research sprint to map out different aspects of the income problem, their inter-connectivity, and the relative importance to community members. 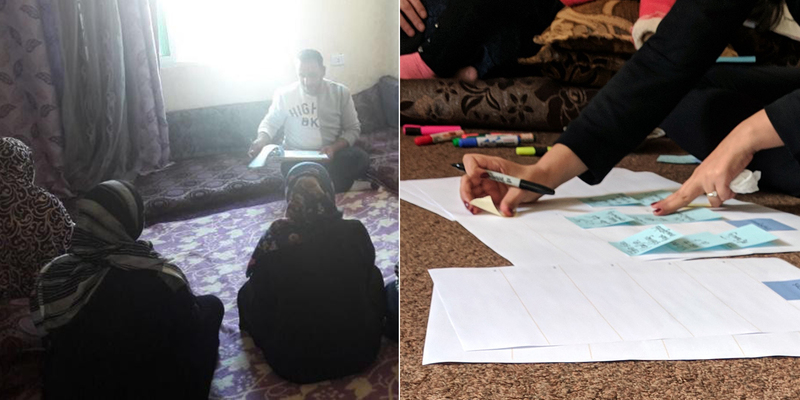 All of the insights and materials created during this design research sprint were then used as inputs for a challenge framing workshop, to which we invited economic specialists working on home-based business regulation in Jordan, a Syrian business owner (and employer), and a young Syrian jobseeker who generates income through virtual/online opportunities. 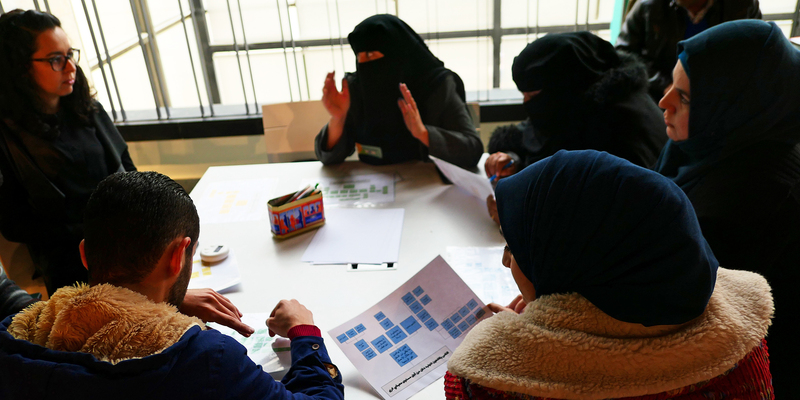 Based on discussions in the workshop, income sufficiency, predictability, and safety (the degree to which the income source exposes the income generator to risk, mainly exploitation or deportation) emerged as critical elements . This led us to formulate our final challenge statement: How can we ensure that vulnerable households have access to sufficient, predictable income that does not expose them to risks? 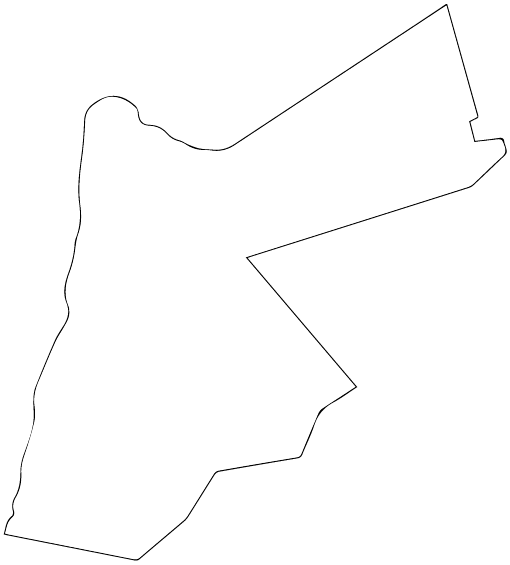 Once Mahali’s first design challenge was defined, we began identifying and recruiting Mahali participants, individuals who were interested in working to address this challenge, from a variety of backgrounds, including refugees and vulnerable people living in Jordan, civic and social leaders, community-based organizations, and local entrepreneurs. 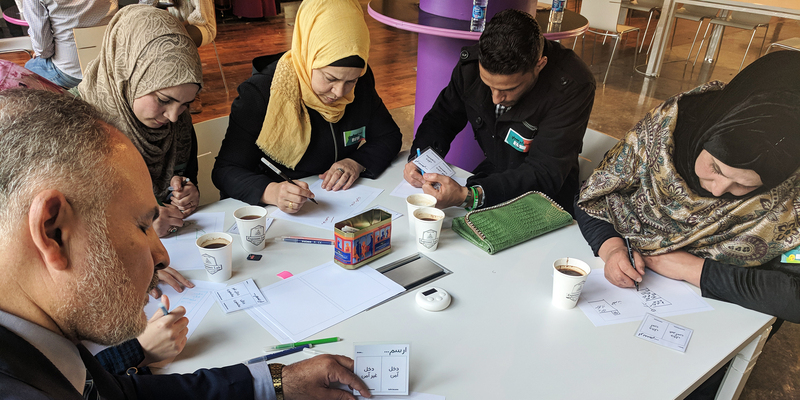 We spent time thinking about the attributes and personality traits that would make for ideal candidates and determined a set of six attributes: empathetic, systems-thinker, facilitator, action-oriented, curious, and creative. 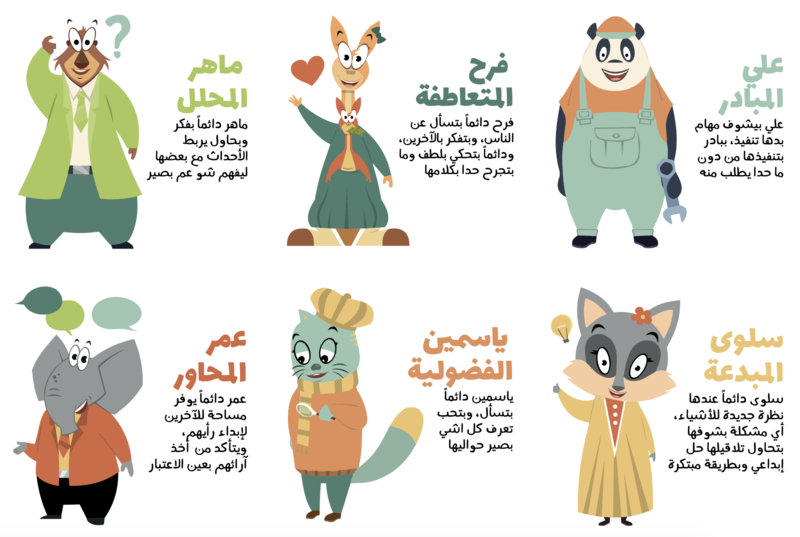 I turned these six attributes into approachable cartoon characters that easily conveyed these sought-after traits to prospective applicants, as well as community outreach volunteers who would support Mahali in identifying and finding potential candidates. Then, we designed the application process, including channels to funnel and identify changemakers as potential participants. 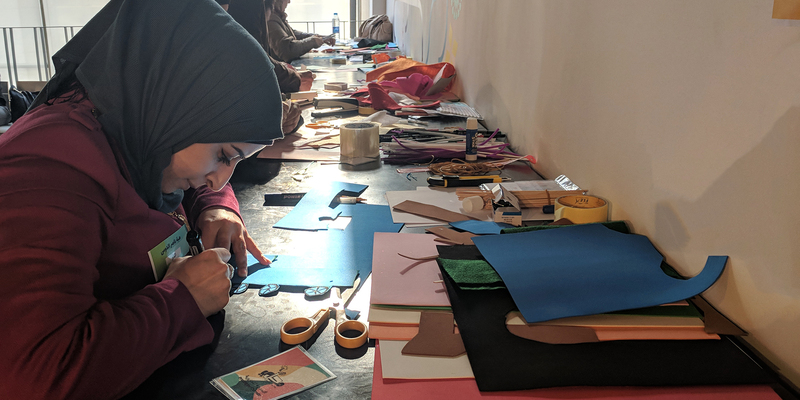 In order to support an equitable application process, we designed a two-part application that would allow people to demonstrate their creativity and problem-solving skills, in addition to expressing their ideas. The first round of the application was written, and could be completed either online, or with the assistance of community outreach volunteers, to ensure that, neither, previous education levels, nor access to technology, would be barriers to entry. The top-scorers from the first round were then invited to participate in the second round, an in-person application event that incorporated a combination of interviews, role-plays, and individual and group activities aimed at assessing the participants’ strengths in communication, critical-thinking, systems-thinking, idea generation, facilitation, creativity, curiosity, and passion. I helped create the outline of the application process as a whole, and led the development and implementation of the in-person application activities. Forty participants were ultimately selected to participate in a five-day design bootcamp. We intended to achieve three main goals through the bootcamp: (1) Have teams work on the design challenges through a more focused lens to constrain the problem space in a way that enables meaningful community-driven solutions; (2) Transfer knowledge of the problem space and foundational human-centered design skills to participants; and (3) Evaluate and select the 12 individuals who are best suited to participate in the subsequent design sprint. I led the design of the bootcamp curriculum, helped create the participant selection methodology, and co-facilitated the training. The design sprint was a ten-week program meant for participants to develop a validated solution with a promising pathway to scale. 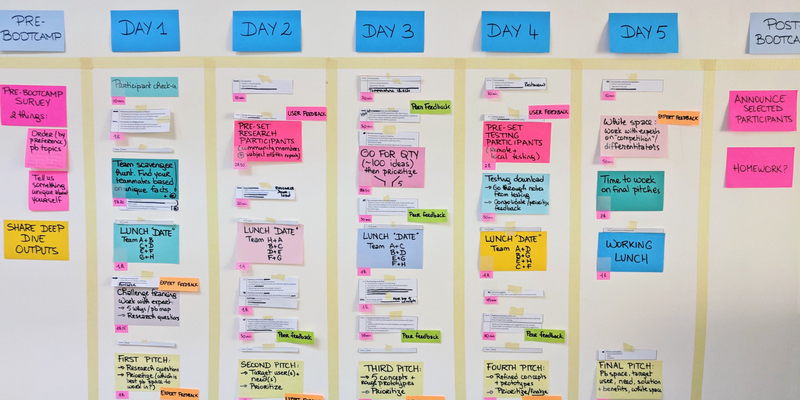 Unlike the bootcamp that detailed a day-by-day, minute-by-minute agenda, we approached this design sprint with a broadly-stroked weekly outline that offered more flexibility to adapt to the needs and progress of the teams, while still hitting the necessary milestones. I served as the main trainer and facilitator during the design sprint, providing technical support to participant teams in validating their problem space, developing solutions, prototyping and testing their solutions, as well as building a user and business case for the solutions. 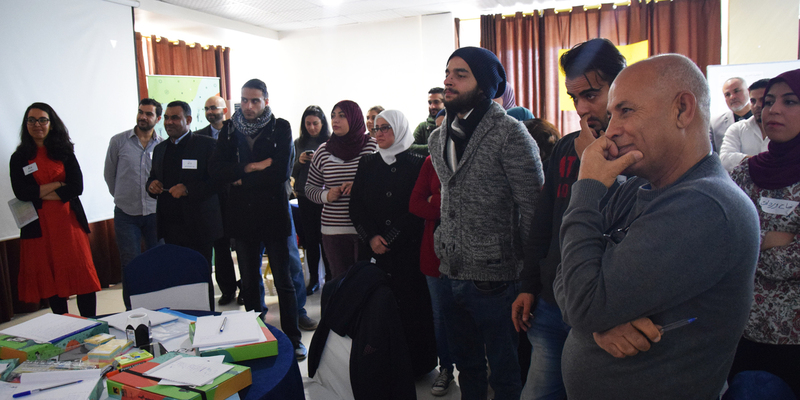 The participants I supported through the design sprint later pitched to a business incubator, and two out of the four teams were selected to receive support in implementing their solutions. 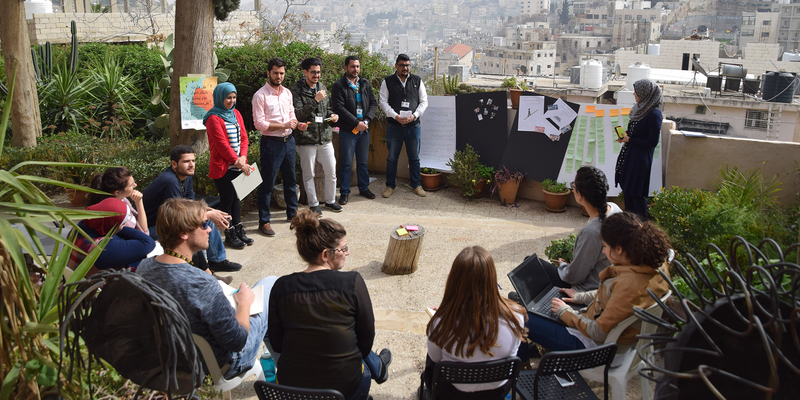 While my tenure with Mahali only coincided with the first design challenge, the lab subsequently tackled two additional challenges related to accessing services and education. This was an opportunity for Mahali to reflect and iterate on the first design challenge, resulting in changes to how the Lab approached the second and third challenges. Changes included, for example, testing a different approach to challenge framing to ensure that it is narrower in scope and actionable for participants. 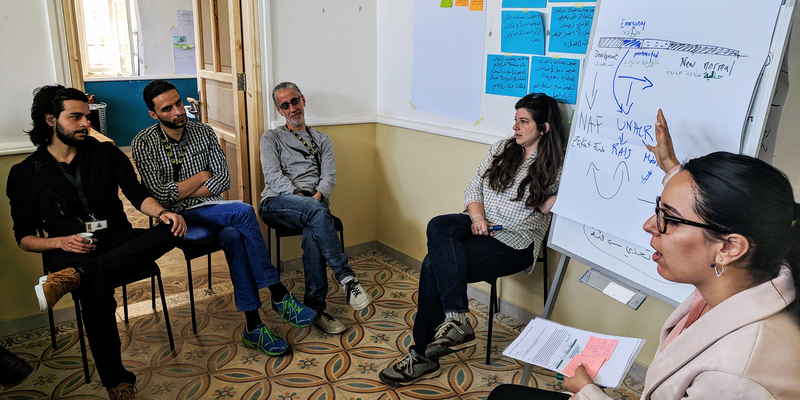 My last blog post describing the design training and facilitation process: “Cooking up a Design Training Curriculum for Non-Designers,” which was featured by DAI Digital. Featured in a UN Office for the Coordination of Humanitarian Affairs Video for the 2018 Humanitarian Day 2018.